Created at Book Dash Cape Town on 28 June 2014, by Karen Lilje, Nicola Rijsdijk and Sam Scarborough. 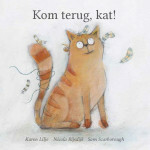 Translated into Afrikaans by Maya Fowler as Kom Terug, Kat! 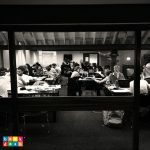 Our second Book Dash saw ten teams working for 12 hours at Cape Town Central Library. The space buzzed with creative energy as each team created a story from scratch.